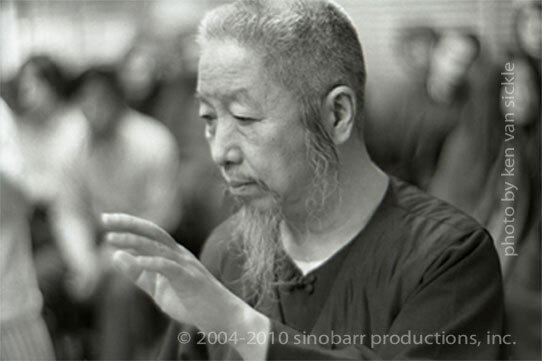 Above, is a photo of Grandmaster Cheng Men Ching, legendary Internal Martial Artist and "Master of the Five Excellences": Poetry, Painting, Calligraphy, Taijiquan and Chinese Medicine. “Internal” refers to developing a clearer sense of the body's more subtle energy flow, called Qi. To the internal martial artist, becoming more aware and sensitive to this life-force is one of their primary goals. Nei Jia Quan (internal family boxing) is the Chinese language term for the internal martial arts. The word “internal,” is referring to a type of training that focuses on developing a greater awareness of the life-giving energy called Qi (life-force) - Chi - Ki - Prana, which modern-day researchers and scientist are indeed validating its presence with their evermore sophisticated measuring devices. However, because of the very subtle nature of Qi, most people still find it very difficult to feel how Qi flows inside their bodies. This is primarily due to the very hurried pace of our modern-day lifestyles, which puts an enormous pressure on the nervous system and in essence "stiffens" our feelings. If the mind can to become less distracted and less stressed, it would then allow the body to relax more deeply and cause the nerve tissues to softened and extend, thereby giving the body a greater capacity to feel more completely. That's one of the main reasons why internal martial arts schools place so much emphasis on Qigong (life-force cultivation practices) right from the beginning, before learning any fighting applications or forms. And, even if one believes themselves to be very "sensitive" and or "intuitive," if your emotions are not balanced, that in turn will greatly diminish the accuracy of your perceptions. So, Meditation practice is also highly emphasized in the internal arts. Most athletes and martial artist, internal or external, would agree that a relaxed body functions better and is less prone to injuries. So, incorporating into one's daily exercise routine rounder and softer movement and breathing methods, such as those practiced in qigong, would be very beneficial thing indeed. This is obviously not a very practical way to develop self-defense skills, but certainly a very safe and balanced approach. However, if your life circumstance is one of living in constant danger and are truly in need of having combat survival skills, then the more practical and realistic approach of the "external" martial arts schools is a much better choice. “External” refers to focusing more on developing the body's core muscle strength, fitness and stamina. To the external martial artist, actualizing real and practical self-defense/fighting skills in a faster time frame, is one of their primary goals. "INTERNAL" vs. "EXTERNAL," is there really a difference? On the surface, there are some real obvious differences between the approach external and internal schools take to learning and teaching the subject of martial arts. External schools such as Karate, WesternBoxing, Kung-Fu, Shaolin Kung-Fu, Wushu, Jujitsu, Capoeira, Judo, Sambo, Wrestling and Mixed Martial Arts, just to name a few, first emphasize learning specific katas (forms) and fighting techniques, then sometimes the more subtle subjects of energy and meditation may be trained later. This way of training is also referred to as going from the "outside to inside" or from "hard to soft," which is directly opposite of the internal method, which goes from the "inside to outside" or from "soft to hard."